Remember back when it was exciting to get a delivery in the mail? You know, inside that small metal bin mounted to a wooden post at the end of your driveway? Well now you can bring back that nostalgia and conquer the digital divide by mailing out real world, physical postcards straight from your Android phone. We took 4 postcard apps through their paces to compare features, delivery times, cost and of course, the quality of the printed photo postcard itself. All cards were ordered on the night of March 10th. Clockwise from top left: Postagram, PostDroid, Touchnote, Postino. The Postagram service by Sincerely offers up a few free postcards to new users, so there's no harm in giving this app a spin. The main differentiator with this service is that your designated photo is only printed within a 3x3 inch square on the postcard, which has perforated edges and can be “popped out” of the encasing card. 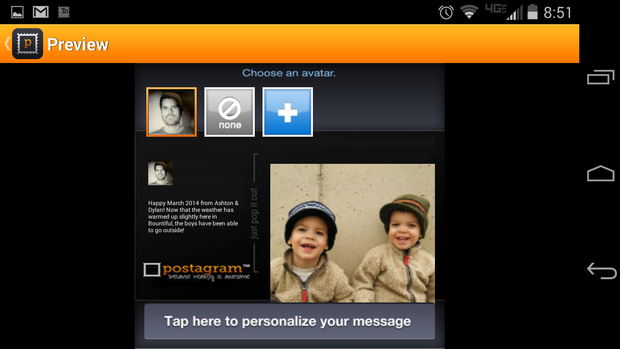 Postagram lets you use your own avatar. 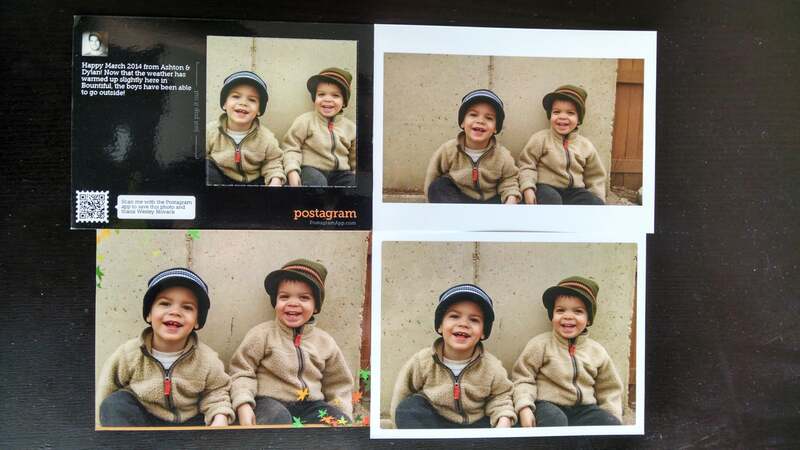 Postagram cards have integrated QR codes. If the card receiver scans the QR code and downloads the Postagram app, the sender gets free credits. It's a neat bit of virality extending to the physical word. These postcards normally cost $1 for US delivery and $2 internationally. However, if you’re feeling mail-happy and want to buy a massive batch of 294 cards at once, you can get the price down to $0.85 per card for US deliveries. I am not a fan of the 3x3 limited size photo pop-out. I just don’t understand how this gimmick adds value to these postcards. All of the competing services plaster a photo on the entire front of the postcard, creating a nice sized picture that can be hung on a fridge or displayed elsewhere. I’m also frustrated by Postagram’s skimpy 140 maximum character text limitation, the most restrictive out of all the apps that I tested. All you can fit on these postcards is a tiny, Twitter-sized quip. My Postagram postcard arrived on 3/14, while all of the other postcards I ordered arrived on 3/13. 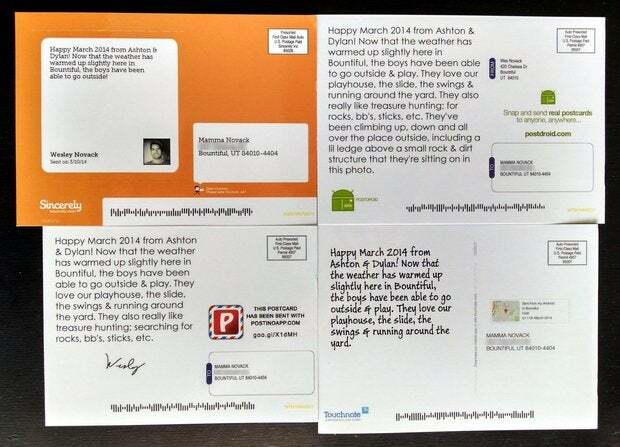 Another mark against Postagram. Postino has a few stand out features that I appreciate. The app contains a small selection of frames and borders that you can wrap around your selected photo, providing the ability to add a little flair to the final image. Postino was the only service that printed a photo all the way to the edge of the card, with no white or black padding. I wish that all of these services would follow Postino’s lead and provide borderless photo printing. Another fun feature is the ability to add a signature using your phone’s touchscreen, which gives it a personal touch. Sign your postcard with Postino. The max limitation for the text portion of these postcards clocks in at a respectable 300 characters. 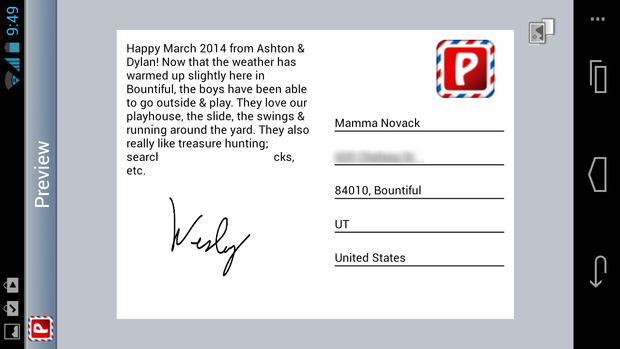 Postino charges $2 per postcard, regardless if the destination is USA, Europe, or Worldwide. Due to this, it was the most expensive service I tried. They do offer a deal of 100 stamps for $149, nudging the price down to $1.49 per postcard if you buy in bulk. I did experience a few issues using the Postino app, unfortunately. First off, the app would not run on my Moto X running Android 4.4, crashing every time I selected a photo. I did get the app to work on my Galaxy Nexus running Android 4.2, but even so, the process flow was not very uniform or intuitive. 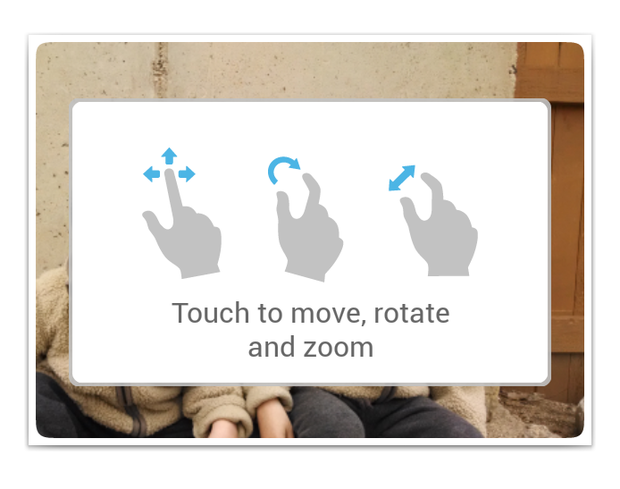 You have to tap the Android system ‘back’ key to continue in some areas, and in others, you have to tap the menu button and then click the save option to continue on. My Postino card arrived on 3/13. PostDroid (found in Google Play under the title Postcards, Mugs, Calendars...) allows you to save postcard drafts, schedule postcards to be sent in the future, and allows for a whopping 450 characters of text on its cards. This is the most text allowed on a postcard out of all of the apps tested. There is no single postcard purchase option, with the minimum amount available being $5 for 4 postcard credits, or $1.25 per card. Looking at package prices, I saw a promo bundle offered of 45 credits for $40, equaling out to $0.89 per postcard. For some strange reason, the PostDroid app doesn’t allow any image manipulation whatsoever. No zooming, no cropping, nada. 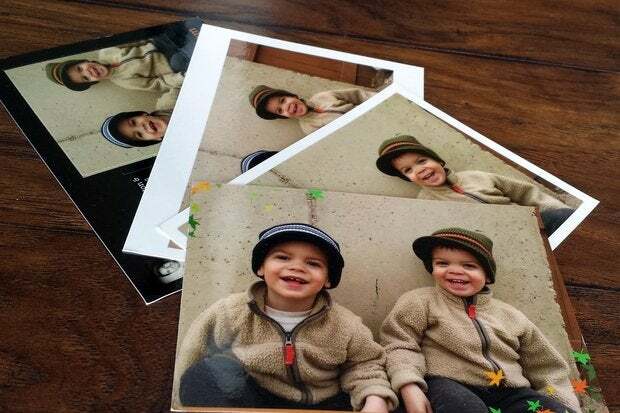 You’ll notice that the PostDroid card I received has thick white borders over the top and bottom of the photo, the result of trying to squeeze a widescreen aspect ratio photo into a 4x6 postcard. 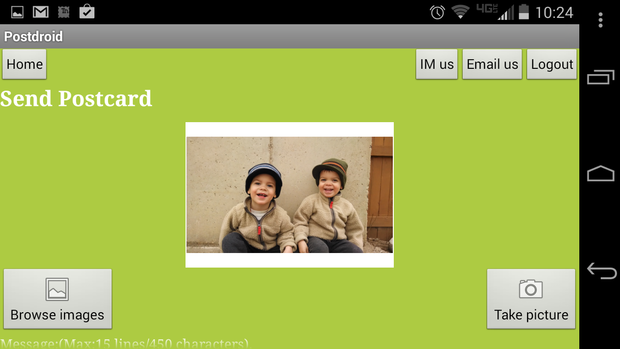 The PostDroid app itself is also very cluttered, unpolished and not designed well. Buttons are scattered all about the UI, in seemingly no particular order, all atop a jarring lime green background. The PostDroid app has buttons everywhere. My PostDroid card arrived on 3/13. The Touchnote app is well designed and flows well. Out of all the postcard apps I tested, Touchnote was the most elegant and the easiest to use. 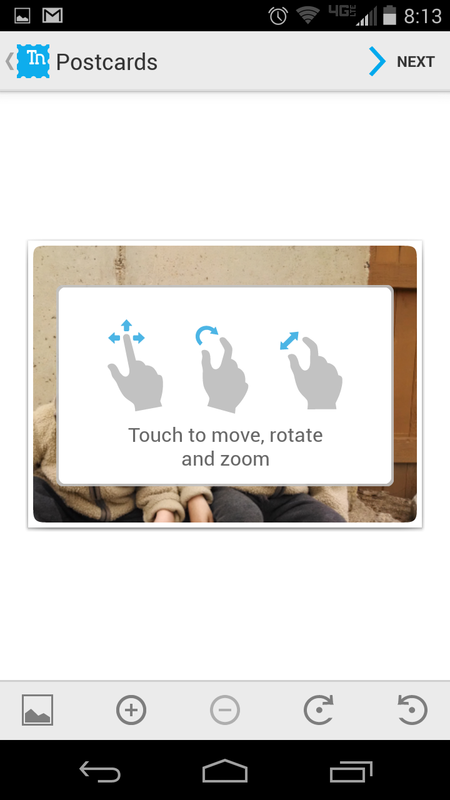 After selecting a photo, you can reposition it, rotate it or zoom using your touch controls, just how you would expect it to work on a smartphone. 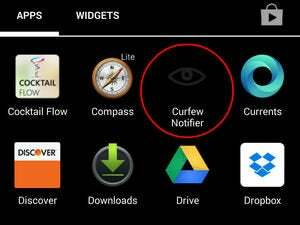 One of Touchnote’s novel features is the optional map print out. When you’re sending out a postcard from your phone, Touchnote reads your GPS location and can include a micro Google map image of your whereabouts, which it prints above the ‘TO’ address. This map block also includes the date and the city or town name, printed in text. 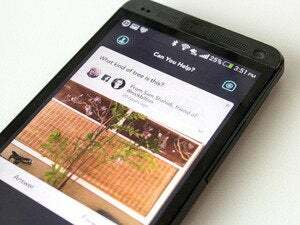 The app has Facebook integration, allowing you to login with your Facebook credentials and share your photo postcards with your Facebook friends, if desired. Touchnote cards cost $1.49 each and ship worldwide, or you can purchase a 75 pack for $74.50, bringing them down to $0.99 each. My Touchnote card arrived on 3/13. Clockwise from top left; Postagram, PostDroid, Touchnote, Postino.